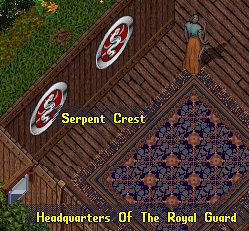 In the Headquarters of the Royal Guard lies a mysterious gem that predicts when something is going to happen within the realm. So truly magnificent is this fabled gem, that I set out with my sketchbook in search of it. 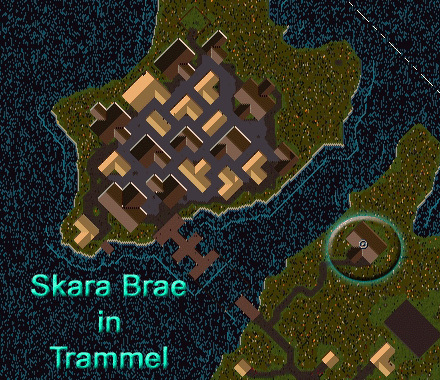 I recalled to the Bank of Skara Brae and made my way southeast along the cobbled streets, passing the bustling shops and merchants. I came to the wooden docks, the strong scent of pickled fish from the stacked barrels causing my eyes to water as I made my way to the end of the docks. 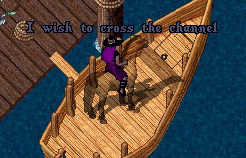 Two boats stood at the end, I carefully guided my mount across the plank and spoke my desire to cross the channel. In what seemed to be only a few seconds later, I was across the short channel and on the mainland docks and on the last stretch to the Ranger’s Hall. I made my way along the twisting path and was soon hailed by two gentlemen as I approached the wooden building nestled amongst the trees. The first introduced himself as Markham and said he was the a local crier from the town of Skara Brae. Apparently, the town officials had delivered a order that a town crier should be stationed at the Headquarters of the Royal Guard should news of a attack reach the Britannia News Network. Markham introduced me to the man who stood next to him, Laird of the Skara Brae Stable. I shook the gentleman’s callused hand as he informed me he was here to retrieve animals for the Royal Guards when asked. Very useful indeed! As I walked inside, the first thing I noticed was the two large crests on the wall on my left, the giant silver serpent prominent on their face. I was greeted with the nods of a few rangers who stood guarding the headquarters. As I turned my eyes to the far end of the hall, I was amazed to see a tree growing through the floorboards of the hall. Perched upon one of the leafless branches was a small bird whom I recognized immediately as Caw. Caw turned his head slightly as if regarding the meaning behind my visit. Nearby was etched stone pillar, closely resembling a guild stone. I touched the lettering with my hand, softly breathing the words inscribed upon it’s face, “In Memory Our Fallen Comrades.” Closing my eyes for a few silent moments, I paid my sincere respect for those who had fallen in this and past wars. From there I moved to take a closer look at two hanging tapestries over a expertly crafted display case. I was met with two of the most heart wrenching memories that almost all of Britannia shares. The funeral of Lord Blackthorn and the departure of Lord British, two important events that have changed our lands forever. 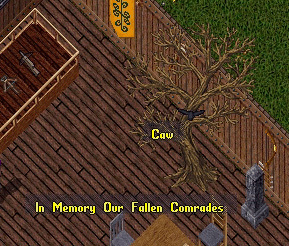 With a soft sigh, I dropped my gaze to the floor near Caw’s Roost. There they were!! The fabled gems that has the ability to predict the events of the realm. As I stood there staring at the pulsating gems, I felt someone standing next to me. I looked over to see a figure cloaked in black, and he spoke to me about the gem and it’s meaning so I might better help the people of Britannia understand it’s meaning. He also placed a book on the table to help others who came along later understand the gem alert system. When all three Gems are there, all is safe in the realm. 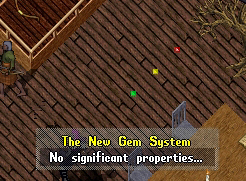 When the GREEN Gem is Gone, it means that there will be a need for the Royal Guard to gather that day. When the Yellow Gem is Gone, it means that the Royal Guard is needed within four hours. When the Red Gem is Gone, it means the Royal Guard are currently out assisting the realm.. I quickly wrote down the details of this mysterious gem and as I looked up to ask this figure more questions, he was gone. He resembled some of the infamous spirits that had haunted the elven lands during my last visit, and I wondered quietly if it was indeed the same being. One thing was for certain that this creature knew what he was talking about and seemed to speak with a air of authority regarding the gem. I marked myself a rune and thanked the rangers for their hospitality during my visit. With a silent nod to the ever-watching Caw, I recalled home to begin writing the details of this amazing journey of discovery. I encourage the readers to spread the news of this fantastic gem to their guild mates and allies, it is through tools such as thee that we can band together to destroy whatever threatens our realm.